Most of the sentences imposed on these children were mandatory: the court could not give any consideration to the child's age or life history. Some of the children were charged with crimes that do not involve homicide or even injury; many were convicted for offenses where older teenagers or adults were involved and primarily responsible for the crime; nearly two-thirds are children of color. Over 2225 juveniles (age 17 or younger) in the United States have been sentenced to life imprisonment without parole. All of these cases raise important legal, penological, and moral issues. However, EJI believes that such a harsh sentence for the youngest offenders -- children who are 13 and 14 -- is cruel and unusual in violation of the Eighth Amendment to the United States Constitution. These children should be re-sentenced to parole- eligible sentences as soon as possible. Sentences of life imprisonment with no parole also violate international law and the Convention on the Rights of the Child, which has been ratified by every country in the world except the United States and Somalia. 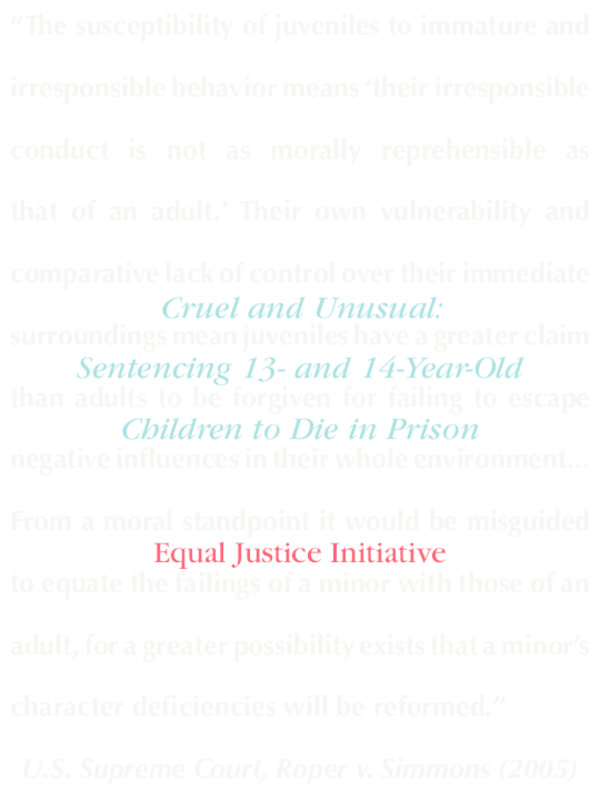 EJI has launched a litigation campaign to challenge death in prison sentences imposed on young children. This report is intended to illuminate this cruel and unusual punishment inflicted on children, particularly for those who have been without legal help for so long that the procedural obstacles to winning relief in court will be formidable. Increased public awareness, coupled with informed activity by advocacy groups, will be necessary to reform policies that reflect a lack of perspective and hope for young children. Copyright 2007 by the Equal Justice Initiative. All rights reserved. No part of this publication may be reproduced in any form or by any electronic or mechanical means without permission in writing from the Equal Justice Initiative.